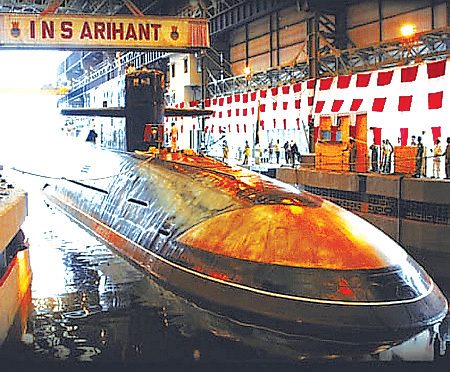 On July 26, 2009, the tenth anniversary of the Vijay diwas (Kargil victory), Indian Navy formally gave a glimpse of its first SSBN ‘Arihant’ (the term means: Slayer of Enemies) when the submarine was launched by the then Prime Minister, Dr Manmohan Singh at a specially constructed covered dock in the Shipbuilding Centre at Visakhapatnam. Toasting this special occasion the preceding evening were mentors (Retired Admirals from the Indian Navy), Russian friends and executors of the project (the Indian defence industry); gentlemen who dared to dream big for giving a resurgent India a credible second strike capability — the sea based leg of the Triad. They reminisced that it was during the 1971 war, when the USS Enterprise set course for the Bay of Bengal, reportedly tailed by a Soviet nuclear submarine that our leadership first thought of possessing a nuclear-powered submarine to deter an intervention by a much superior power. Dove-tailing the naval requirement with the ongoing Nuclear programme, it was to take another three decades before India attained the distinction of becoming the first country to build a SSBN without first designing and constructing a smaller nuclear submarine, the SSN. After a quiet commissioning in August 2016, INS Arihant completed her first Deterrence Patrol last month. The complexity involved in building a nuclear submarine indigenously, arming it with a submarine launched land attack missile tipped with a nuclear warhead, putting her to sea with a trained crew and having a Command & Control system in place was worthy of an acknowledgement by the Prime Minister Narendra Modi, who congratulated the crew personally and announced to the world that India had joined the select group comprising United States, China, Russia, Britain and France in operationalising a second strike capability at sea. Built under the Advanced Technology Vessel (ATV) programme, INS Arihant with a length of 112 metres, a beam of 11 metres and a draught of 10 metres displaces approximately 6,000 tonnes and is capable of diving upto a depth of 300 metres. She is propelled by an 83-megawatt pressurised water reactor and can attain a maximum speed of over 20 knots underwater. Armed with K-15 missiles (with a range of less than 1,000 km) which can be mated with a nuclear warhead, she has a very high indigenous content. The Indian Navy and the nation have only indicated a statement of intent. There is much ground to cover. As the SSBN programme progresses it will be possible to enhance our capabilities and achieve an ability to target both China and Pakistan from the Bay of Bengal itself. With a nuclear policy of ‘No First Use’, it is imperative for India to have a credible nuclear deterrent at sea, certainly the most important leg of the Triad. Nuclear delivery systems on land and air can be taken out in the first strike by a belligerent enemy, but it is well-nigh impossible for the enemy to detect, track and target a SSBN on patrol away from her base. The French have the Triomphant class with M51 missiles of ranges more than 8,000 km and finally China with four Type 094 Jin class SSBNs with JL2/3 missiles of claimed ranges of 8,500 km. India should be able to operationalise three more SSBNs in the next five years with the range of the missiles increasing to more than 3,500 km; but the most significant achievement would be the ability to build the last submarine of the series fully indigenously. The SSBN ecosystem of our fledgling Military Industrial Complex has indeed come of age. If I was to underscore the most urgent, it would be the early commissioning of a dedicated submarine base where these assets could be berthed safely and from where they are able to sail into the deep, silently avoiding the prying eyes of the enemy! The ATV project has been the most successful of what we now term as the ‘Make in India’ Initiative. Commissioning of the Defence Machinery Development Establishment (DMDE) in Hyderabad to involve the local industry to indigenise submarine spares, successful progress and dove-tailing of the missiles programme by DRDO laboratories, building of a small nuclear reactor by Bhabha Atomic Research Centre, building of the hull by Larsen & Toubro, the designing and making of the steam systems by Walchandnagar Industries, training of the submarine crew by the Indian Navy, putting in place procedures for safe handling of nuclear material and evolving responses to nuclear contingencies are some of the specific achievements we can be proud of. The programme has become a sterling example for meeting shortfalls in our Defence requirements indigenously. There are many challenges ahead before we can rightly claim to be at par with the big five. Commissioning of more SSBN submarines, improving the design to reduce the acoustic signatures and increasing the range of the nuclear tipped missiles are some of them; but if I was to underscore the most urgent, it would be the early commissioning of a dedicated submarine base where these assets could be berthed safely and from where they are able to sail into the deep, silently avoiding the prying eyes of the enemy!